London, UK – Wednesday, 22nd April 2015 – Legendary globe trotting Championship referee Mickey Vann will be making one of his shortest international journeys in a long while, this coming weekend, when he officiates the first Malta Boxing Commission (MBC) sanctioned event in Scotland, the Stewart Allan promoted event at the Rivals Gym in Wishaw on Saturday 25th April 2015. 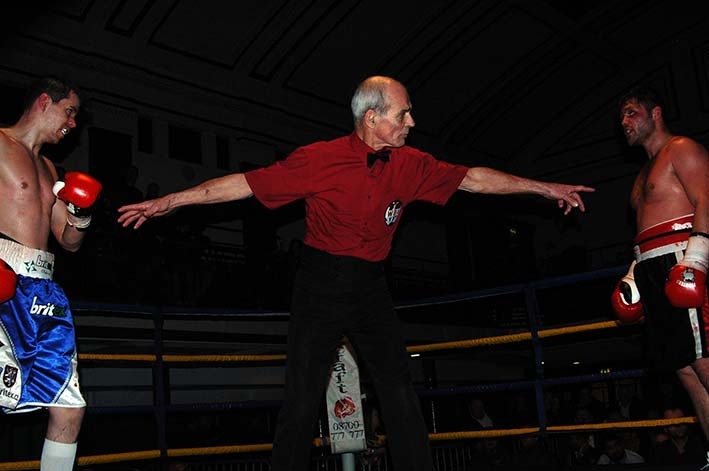 Vann, who has been the MBC’s chief referee since 2013, has been officiating for close to forty years, the first bout he refereed was Eddie Smith versus Joe Jackson at the Anglo American Sporting Club in Manchester on the 11th October 1976. It would be some seven years later before Vann refereed his first domestic Championship bout, the BBBofC Central Area Featherweight Title fight between Steve Pollard and Steve Farnsworth at the Tiffany’s Nightclub in Hull on the 29th March 1983. Three years later Vann refereed his first International Championship contest, the Commonwealth Lightweight Title fight between Zimbabwe’s Langton Tinago and Australia’s Graeme Brooke at the Granada Studios in Manchester on 23rd August 1986. With numerous British, Commonwealth and European title contests under his belt on the 8th June 1990 Vann refereed his first World Championship bout, the WBC World Minimumweight title fight between Japan’s Hideyuki Ohashi and Thailand’s Napa Kiatwanchai in Tokyo, Japan. To date Vann has refereed one hundred and forty three International, Inter-Continental and World title contests for the World Sanctioning Organisations, such as WBC, WBO, IBF, WBU etc as well as an even higher number of European, Commonwealth, British and Irish domestic title fights during his eight hundred and eighty two bout career to date. The most recent of these bouts being the WBO Inter-Continental Cruiserweight title fight between Ukrainian Oleksandr Usyk and Russian Andry Knyazev, which took place in Kiev just last weekend. In addition Vann has also judged one hundred and seventy three Championship contests since 1978, taking his officiating career total to an incredible one thousand and fifty five contests, sorry make that one thousand and fifty six contests if we include the upcoming event this weekend. Shortly after returning from Kiev, the effervescent Vann spoke briefly about his career and the upcoming event he is to officiate in Scotland on Saturday. My most memorable fight would naturally be Lennox Lewis and Frank Bruno at Cardiff Arms Park, that was history. But have refereed so many memorable fights, where do I start, Shea Neary and Mickey Ward, now that was a great fight. There’s some from years ago I can remember, like Jean-Marc Renard against Farid Benredjeb, oh what a war that was, they both ended up in hospital. They were two South Africans but from different tribes, they wanted me to referee it, not a South African, which was very much appreciated. I remember refereeing the WBC mandatory Lightweight title fight, between Leavander Johnson and Miguel Angel Gonzalez, in a bullring, which was an experience. I refereed in America Jorge Paez and Angel Manfredy, that was a terrific fight, in fact refereed three or four times in America. I think if you count them all I think I refereed in thirty nine different countries, I left school at seven and went back at thirteen and left again at fourteen and I didn’t know at that time that there were that many countries in the world. I didn’t, honestly. I just enjoy what I do, you know I’ve been to Russia, Argentina, Japan, all over, I just got back from Kiev. People come up for photographs, even in Kiev, with Mickey the dancer and then they pretend they are you moving about, it’s lovely. I pick out nothing really, I just pick out what has been the big fights that I’ve enjoyed. I qualified as a star grade referee in 1978 and I’m still going, I’d done hundreds of fights by then, it’s not a job really, it’s just enjoyment as such. I wasn’t a very good pro fighter, I was a pretty good amateur, I had sixty six fights as an amateur and lost nineteen, but you used to have three fights a day in the Championships, you fought in the morning, won that you fought in the afternoon and if you won that you fought at night to get through to the next round, in the Army Championships and the boys clubs sort of thing, that’s what we all did. As a pro I have fourteen fights but I lost nine, but I enjoyed it, I’m glad I turned pro and I’m glad I fought, I’m glad I fought amateur and pro and I missed it when I retired and I wanted to do something and my manager suggested I referee, I wanted to coach but Tommy Miller, my manager said to me ‘Jesus Mick what could you teach anyone’, so he said to me you want to be a referee, so I put in for it and it took me two years and I qualified. I’ve enjoyed every minute of it and some times have been better than others, in fact they used to hate me in Scotland, they thought I hated the Scots. I heard this on the radio many times. Alex Morrison will tell you, he thought I was hater of Scotsmen, I wasn’t, just they never seemed to get the verdict from me, so it’s quite ironic that this Saturday it’s the Scottish promoter and the Scottish boxers that asked for me for this show. Mickey Vann will be the referee for both the Sandy Robb versus Mathew Ellis and Scott Allan versus Isaac Quaye that co-headline the Stewart Allan (Rivals Promotions) event at the Rivals Gym in Wishaw, Scotland on Saturday 25th April 2015.